He's the number one! 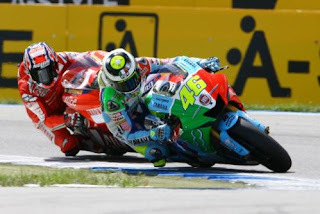 Assen is the temple of motorcycle, where won only who really knows how to drive a motorcycle. Valentino was 11 with a motorcycle worst than all the others...but he arrive 1 ! It's time to change, it's time for a new era. Friday morning i'll go to sign the contract for the rent of my apartment. I'll start my own life, i'll start to cook for me, to iron for me, to give a nice cake for a friendly neiborghood life!! I only hope they will start internet connection fast!! This is a fruit from a tree in my home garden, his name is fico. It's very sweet and nice! In Italy we use the word "fico" like you use "cool" to someone. San Daniele del Friuli is the little town where the best ham in the world is produced, and all the year there is a week end in wich the ham is celebrated. So, a lot of people, music, fun and.... ham!!! And, of couse, a delicious strwberry cake !!! This is a perfect wienerschnitzel!! Potatoes with fried lamb steak and ribes marmalade, coocked by the mother in law of my boss. for happinsess you need only good friends, freedom and analitic life. stop and analize your problems, your dubt, what makes you sad. Before, i was at swiming pool, i put down my beach towel, my book and my suncream. The wind put near some grass....some flowers....some leaf. Some bees fling near...some mosquito brake the balls...some flies. Some ant came near, serching food. So, the point is: wherever you are, wherever you go, will be alwais a new world, a new life that grew up around you and with you. From micro to big, from an evening at swimming pool to a new life in a new country. I'm looking on tv a documentary about Bali. How the narrator, his voice, and how the documentary explane the life, traditions, people from that island remind to the viewer a far, dreaming place. A place where to go only once in lifetime, a place very far from our life. When you tell to some people " i was in Bali" they say " hoo, waw, you luky, you rich"
But...i'm not luky or rich, i simply don't loose a lot of money in useless things ( well, not every time...i'm not perfect :-) ) and i'm a little courious to travel. For me that i'm used a little to travel in asia, that i've friends there, that i've someone like a family there, the point of view is different. For me is not a far place, is not a dreaming place... is only, simply, a normal another place, another country with his, yes, different but normal traditions. Ok la, for me going in vietnam or burma or where i want could happen only once in my life, but now, when i'll plan to go there is not " oh god, i'm going there, i'm realizing a dream"... will be only "i'm going to a new simple country". I think that for a lot of people in asia came in Italy could be like a dream too, but for me is normal travel in italy. We have a lot of dreaming places ( think about Venice or tuscany ) , but i would tell you that they are normal, with your same city life problems. Thats why for me is normal going for a day in malaysia for a wedding. You have only to get your money, go to the agency and buy the fligth tiket. A lot of flight hours? During week we work a lot and we sleep not much or because we go to disco or something else...and that is more stressing, but we do. Be on a plane...you are sit served with drinks and food! I think nothing is far, impossible, a dream... is simply another place where to go for learn new culture, look new places, knew new people. Of course i've my dreams, and they are a lot, but they are possible to realize and when you realize you found them...normal. The most of the time television control our mind and create strange thougth. I'm very happy and surprised, because after only 4-5 times that i'm going to chiropratic my back is working well. And not only it, also my sensations, my mind are more clear. I don't know how to explane, but what Doc. is doing on me is not referred only to my back, but also to my body and mind. I'm back in Italy from... a wknd in Malaysia! The reason is simple: A wedding, a friendschip. For me is a simple, normal thing. Distance, at this time, is not very far. Fling is fast and simple, and for the money you spent.... sometime they gone, sometime they came. At the end, is only important make smile your friends and remember a great sensation every day of your life. Spend 2 days in a plane during 3 days and half is not so impossible, it don't destroy your body. What i felt...is only be bored during return because you really do nothing for 2 days! And miss my friends....but now is one day less for the next meeting!
" you know that an emotion then will stay "